When many homeowners think about cleaning their showers, the majority of them do not know the best products or methods to use when performing deep cleaning. As a consequence, surfaces become damaged little by little. This eventually leads to a need for professional help. Our next customer hired our tile cleaning services in Valhalla, NY because she noticed that the grout lines on her shower walls and floor were getting darker in color and the porcelain tiles were beginning to look opaque. She even detected mold and mildew in the expansion joints. She searched online for DIY methods to stop the issues, but after several tries there was still no change. The problem seemed to be getting worse and she didn't think her shower would ever look good again. One day a friend who visited her mentioned he had a similar problem in his guest bathroom. To solve the issue, he hired Sir Grout Westchester. He assured the homeowner the results were incredible, so she decided to search 'tile cleaning specialists in Valhalla, NY' and found our website in the top results. Browsing through it, she could verify the quality of our company's work by seeing photos in the "Before and After" section and comparing different problems with the issue she had on her shower. After reading many reviews left by the clients, she was convinced we were what she was looking for and didn't waste any more time. She placed a call and set up a date for a free in-home evaluation. 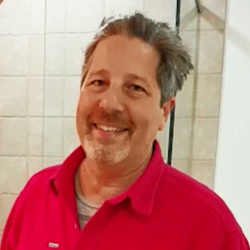 On the assessment day, Sir Grout Westchester's owner, Tim O'Leary, went to the customer's house to examine the shower and to offer the right service to completely restore it. He determined the issue right away and pointed out the accumulated soap residue that had built up on the walls below the water line. He explained to the client that the talc in the bar soap that they showered with regularly would dry on the tile after the water evaporated leaving a residue that just built up over time. The lack of proper maintenance combined with the use of incorrect cleaning products contributed to the bad condition of the shower. Tim recommended a thorough tile cleaning process that would leave the surface looking new. The owner agreed and set up a date for the job. On the day scheduled, Sir Grout's specialist returned to the house and began by scraping the heaviest accumulation of soap scum off the porcelain tiles before applying a proper cleaner on the surface and letting it soak for a few minutes. Next, he used an abrasive scrubber to remove the remaining dirt and grime from the tiles, then used pressurized 300-degree vapor steam to clean the grout lines. For the expansion joints the tech cut out the old moldy silicone caulk and dried out the seams after first cleaning them. The next step was to seal the grout. Our expert used Sir Grout's colorsealant, a water-based, non-toxic acrylic sealer that makes your grout lines impervious to water and spills, protects them from stains, and makes them mold and mildew resistant. The final step was to caulk all the vertical and horizontal seams with a premium marine silicone made for wet environments. Once completed the homeowner was invited in to see her beautifully restored shower. She was amazed to see there was no evidence of dirt and grime on the surface, the porcelain tiles looked brand-new, and the grout lines were totally clean. The woman thanked our technician for the service and mentioned that if anyone she knew was in need of a hard surface restoration company, she would definitely recommend ours. Before leaving, the Sir Grout technician gave her some recommendations on how to properly clean and maintain the shower moving forward to keep it looking beautiful for as long as possible. If you notice your tiles and grout lines need to be restored, Sir Grout Westchester is your top choice. Our experienced specialists will provide the best tile cleaning services available. To set up a date for an in-home evaluation, call us at (914) 592-5902 or fill out the "Request a Quote" form on this website. If you want to find out more about our latest promotions, subscribe to our newsletter.